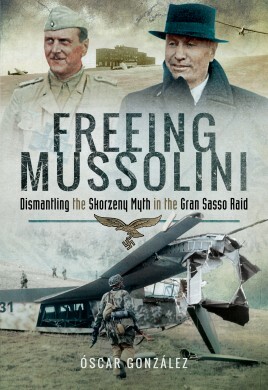 The operation to free Mussolini, who was being held prisoner in a high mountain hotel on the summit of Gran Sasso, Italy in September 1943, is without a doubt one of the most spectacular operations not only of the Second World War, but in all military history. German paratroopers, the Wehrmacht's elite, were responsible for organising the rescue in record time, and executing a daring and perfectly synchronised operation between land and airborne detachments. Surprise and speed were the Fallschirmjäger's main weapons, surprising the Italian garrison guarding il Duce. For political reasons Otto Skorzeny, the clever SS officer, also participated in the operation, leading a dozen of his commandos. Propaganda and his connections with Himmler made him into the false hero of the mission, over-emphasising his role in the whole search and rescue operation. Based on the testimony of several protagonists in this incredible operation, as well as analysing major documents (letters, reports by General Kurt Student etc.) and the abundant literature available on the subject, this book dismantles the 'Skorzeny Myth' and reveals the truth of what really happened in a mission that even Churchill called 'one of great daring'. Óscar González López was born in 1969 and is a professor of History and Philosophy. He alternates teaching with historical research, collecting the oral memory of Second World War veterans. He has published several books and articles on German and Allied paratroopers, as well as on Spanish volunteers in the Wehrmacht (Blue Division). Several of his works have been translated into English, German and Norwegian.